I liked the Odds. I remember their older stuff, but the first Odds album I bought was "Good Weird Feeling". 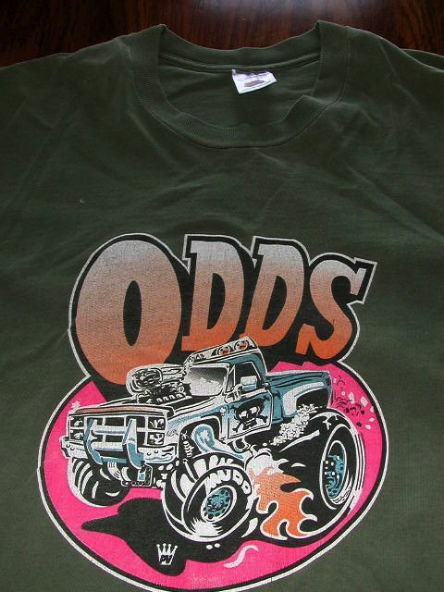 This shirt is from who knows which Odds show, I saw them a pile. At the W.O.W. show, in Nanaimo for a Hornets Rugby thing, at Fox Fest and probably a few more times. The video for this song is also very cool and features Junkhouse and The Pursuit of Happiness only one of which I've seen live to my eternal shame. I wanted to see Junkhouse in Ottawa but I couldn't find anyone who would go with me. That was the last concert I didn't go to, because I couldn't find anyone to go with. A few weeks later I went to Steve Earle by myself just after the ice storm. Although I've never seen Junkhouse live, I consider "Birthday Boy" one of the best ten dollar bills I ever spent. I eventually really came to dig Blackie and the Rodeo Kings (who I've since seen live) but I have seen Tom Wilson several times solo and I've bought almost everything he's put out. Tom is amazing live by the way, great raw power in his voice, plus real charisma on stage, a funny guy.